Cottonwood borers are a wood boring beetle common the Great Plains area of the United States. These bugs can typically be found on cottonwood, poplar, and willow trees. Cottonwood borers can be identified by their distinctly patterned bodies. Adults are typically around 1 ½ inches long and ½ inch wide. They have long antennae are roughly as long as their bodies. Their backs are black with white stripes, similar to a zebra. Cottonwood borers feed on the shoots of trees, causing the shoots to shrivel and die. Fortunately, the extent of the cottonwood borers’ damage does not go far and will not typically cause permanent harm to trees. However, young trees that are more susceptible to disease and rot are more likely to suffer permanent damage from these pests. Cottonwood borers are most commonly seen from late June until mid-August, as this is when the adults emerge. Harlequin bugs are small bugs that are native to Central America, but can frequently be found in areas of the United States, including Kansas. These are small bugs, averaging just over ½ inch in length. They have oval, shield shaped bodies with red-orange backs and black markings, similar in appearance to the lady bug. Harlequin bugs find cole crops to live and feed on. This includes crops of broccoli, cabbage, kale, cauliflower, and other vegetation. If these crops are not available, harlequin bugs will also feed on eggplant, potato, tomato, and other crops. They feed on the leaves of these plants, sucking the nutrients until the leaf is stunted in growth or dies. Generally, harlequin bug infestations do not last long, nor do they leave long-lasting damage. However, for farmers of large crops, controlling any pest population is important. Harlequin bugs emerge in the late spring and early summer, so they are most commonly spotted around this time. Minute pirate bugs are very small bugs that can be found in the midwestern United States. These bugs are about 1/16 to &frac18; inch long, roughly the size of a pinhead. Minute pirate bugs live primarily in corn fields or among other crops. Their size limits the damage they can do to crops. However, despite their size, they are effective predators to more harmful crop pests. When minute pirate bugs wander away from their typical corn field home, they may land on a human. While their bite is not harmful, it often causes slight discomfort and itchiness. The bite is not to feed on blood or out of self-defense — the minute pirate bug is simply testing your skin to see if you are food or not. Tomato and tobacco hornworms are part of a subspecies of moths found in North America. The larval hornworms are green caterpillars, roughly 4 inches long. When the hornworms are fully grown, they become gray moths, staying around the same length as their larval state. 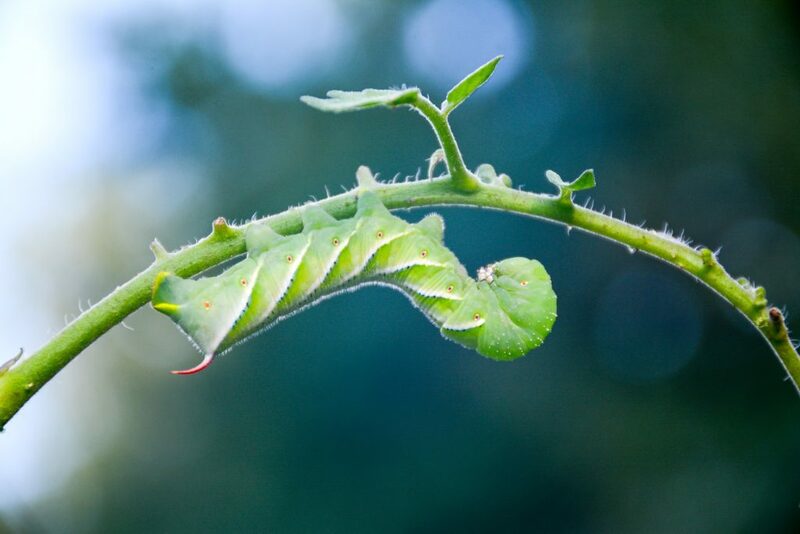 Tomato and tobacco hornworms do the most damage during their larval state. They feed on tomato and tobacco plants, but will also feast on eggplants, peppers, and potatoes. The tomato and tobacco hornworm pupae overwinter, meaning that the eggs lie in wait during the winter for some disturbance in the spring to awaken them. The larvae are seen most often in the spring, while the moths can be found mid-summer. The yellownecked caterpillar is part of a species of moths found primarily east of the Rocky Mountains. They are often found in orchards for apple, pear, cherry, and pear trees, as well as in oak, hickory, elm, and birch trees. Like other pests on this list, yellownecked caterpillars will not often do permanent or fatal damage to a plant. However, because they feast on leaves and foliage, they can stunt tree or plant growth. Yellownecked caterpillars peak in the summer months when the moths deposit their eggs in the ground. If you’re experience issues with these pests or others, contact Edge for pest control in Lawrence, KS and the surrounding area.